Recently I passed a significant (to me) milestone on my Youtube Channel. I tipped over the 50,000 views mark. Yes, many others have much more. But I am proud of my little corner of the internet! I take pride in my channel and this blog, as well as the interactions we have on Facebook, Twitter and Instagram. It's been rewarding to find others all over the world who share my interests and positivity. 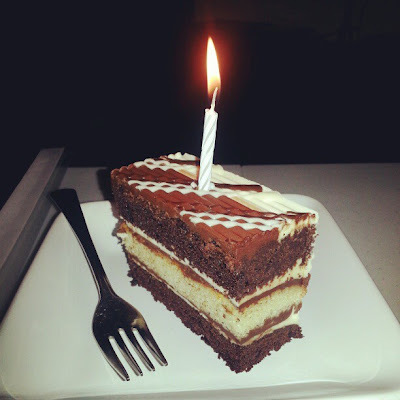 To mark the occasion, my friend Loni surprised me with this piece of cake complete with a lit candle. Delicious and heartfelt. I know not everyone understands my hobby, but thank you for supporting me. It brings me more joy than I can express. Are there any specific videos or blog posts you'd like to see? You deserve it Mare! Way to go! you know I watch you every day :) Love you!